Tomorrow the Vatican is scheduled to release an encyclical letter by Pope Francis entitled Laudato Si dealing with ecological concerns. This has a lot of people fairly worked up, including people on Catholic left who haven't felt compelled to listen to any source of Catholic teaching other than their consciences since Humanae Vitae was widely rejected in 1968 and others on the secular left who pretty much don't listen to the Church on anything. I suppose that for those who consider the main function of religious doctrine to be to provide out-of-context pull-quotes to bludgeon their ideological opponents with, this will at least be a source of some additional quotes. However, overall I'm not sure why there is so much fuss, because I kind of doubt that there will be a whole lot in the encyclical which will impinge on people's daily lives in obvious ways. We all are affected in our daily lives by teachings on marriage and the family, we all are responsible for our personal devotions and our behavior towards others, but very few of us set national budgets, invent new technologies, or enact global environmental treaties. 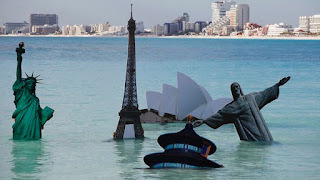 Nonetheless, it seems like a topical day to martial a few thoughts on the climate change issue, which is one that I don't touch on a whole lot because of the frustrations and tensions of the issue and its partisans. I'm a pretty partisan guy, and I'm a conservative on most issues, so one of the reasons I don't talk a ton about the climate change/global warming issue is that I don't necessarily agree with most conservatives on the issue. For a variety of reasons, American conservatives in particular are pretty protective of free markets, technology and capitalism. Social conservatives are protective of the family and traditional Christian sexual morals. Environmentalists tend to be politically on the left, and a lot of their advocacy centers around limiting emissions of greenhouse gasses via government regulation, demanding a smaller economy, and insisting that people have fewer children because humans are seen as "the problem", occasionally even as a "cancer on the planet". Because trying to prevent climate change due to human release of greenhouse gasses fit well with various narratives and desires already present on the political left, that's where the issue came to live, and because American conservatives already disagreed with the left on a lot of those other issues, it came naturally to dispute the climate change theories. It's now pretty much expected for conservatives to dispute that there is any impact of fossil fuel burning on the climate due to the release of greenhouse gasses. In this, conservatives are wrong. - While CO2 is not the most efficient greenhouse gas (methane and water vapor both trap more heat) it does appear to act that way and we really are increasing the level of CO2 in the atmosphere by burning fossil fuels. When plants grow, they take in CO2 and emit oxygen, while using the carbon (along with other elements) to produce... themselves: wood, leaves, stalks, seeds, flowers, etc. Carbon is one of the building blocks of life on earth. That's why in SciFi shows they talk about "carbon based life". If you take wood (like the big pile of firewood in my backyard from the maple tree we took down last winter) and burn it, the carbon in the wood combines with oxygen from the air to form CO2 during the burning, and that CO2 is now back in the atmosphere. So long as trees are taking the CO2 out and we then release it again by burning the left over plant matter, we have a closed system and the level of CO2 remains the same. However, when we dig up coal or oil and burn it, we're taking carbon which has been out of the system for millions of years and adding it to the atmosphere. There's doubtless plant matter getting buried somewhere in peat bogs and lakes and such which may someday turn into coal and oil, and that's taking carbon back out of circulation. But we're re-releasing ancient carbon via fossil fuels a lot faster than the burial of plant matter is sequestering modern carbon, so on net we're increasing the amount of CO2 in the atmosphere. - It really is getting (slightly) warmer. The climate is a massively complex thing. Our real worlds is not like in a SciFi movie, where you have ice planets and desert planets and jungle planets, and you can imagine the whole planet changing temperature. The temperatures that climate scientists are talking about are average global temperatures, adjusting for all sorts of regional and seasonal noise. That noise is the weather we experience on a daily basis. And regionally, an overall increase in global temperatures might result in some parts of the world getting colder while others get warmer. But while there's some room for dispute on how much the temperature is rising and what will happen next (much more on the latter than the former) the tendency to dismiss it all as fraud or fuzzy science is incorrect. While there may well be feedback cycles we don't understand well that will moderate the effects of warming (and if anything, the temperature does seem to be going up less than would otherwise be expected) overall the idea that temperature is going up in a way that is linked with the CO2 level going up is the best supported view. So why is it, given the above, that I'm not a big environmentalist cheerleader? Well, first of all, I do disagree with a lot of the progressive tendencies I mentioned before which made concerns about global warming so congenial to the political left. I don't see people as a cancer on the planet. I think that human beings hold a special place in God's creation, and while I think that we do have a duty not to wantonly destroy the other things God created I don't think the earth is some sort of nature preserve that we need to not affect and maybe pursue voluntary extinction in order to leave pristine. I mean, seriously, there's a lot messed up about secular environmentalism. But my differences aren't just ideological. Because worrying about greenhouse gasses and climate change is so congenial to certain instincts of the left, the environmental movement jumps on a lot of bandwagons that simply do not make sense at a basic scientific level. We may be nearing a sort of tipping point, but up until this point, a lot of the "green" technologies have actually taken more energy (typically fossil fuel energy) to put in place than they produce or save. So while there has been all sorts of advocacy for wind farms and solar panels, and demand for those technologies is doubtless providing the money for research which will eventually get us to real, usable, worthwhile technologies, the pieties around adopting green tech are often delusional. Finally, although some of the basic facts are got right by the left (yes CO2 levels are rising, yes the world is warming a bit) there is a HUGE amount of hysteria and misinformation that gets associated with "global warming alarmism", such as attributing every single weather related problem to "climate change", as if we'd never have hurricanes if everyone drove a Prius. One of the phrases that I think throws people off is the constant discussion of the need to "save the planet". This is a problem, but not because we shouldn't care about our planet. It's a nice planet. It's been given to us to take care of, and we'd rather see it beautiful and full of interesting creatures than a barren wasteland. But the fact is, the planet itself can survive quite a lot. 65 million years ago, the planet got hit by a massive asteroid, plunged into a global night and winter, and most species of land and sea animals went extinct. And yet, the planet remains beautiful and wonderful and now it sports creatures such as us, rather than dinosaurs. 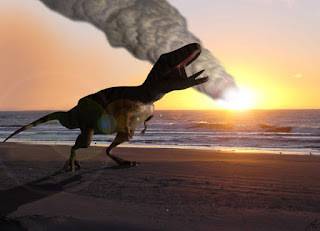 Things change, but the planet itself is in a state of constant change, both affected by the creatures on it and also by outside forces such as that huge piece of rock which hit it one very bad day at the end of the Cretaceous. What we really need to worry about in regards to the extent to which our burning of fossil fuels could be causing a long term warming of the planet is not the planet, it's us. The planet would be fine with a higher ocean level. The planet would be fine with different weather patterns. We, however, have based the location of our cities and populations across the world, the foods we grow, and the way we live, on what temperatures and ocean levels have been like for the last few hundred years. We could adjust to a warmer world with different weather patterns, but periods of human migration and disruption tend to be painful and costly. So rather than thinking about anthropogenic (human caused) climate change as mean old humanity messing up the perfect balance of the nature preserve world which is meant to not show our fingerprints, we should think about it in terms of whether the effects of warming might be ones that would be hard on human civilization. One of the things that scares environmentalists about humanity is that we are an incredibly adaptive and tenacious species. We want to live and thrive, and we do so in more parts of the world than any other animal of our size. We have a significant impact on the land we live on (not like other species don't) and as with other species, that could be a threat to us. But that's just the beginning. We have the ability to invent new ways of producing energy that won't have the side effect of releasing long buried carbon as atmospheric CO2. We may simply grow out of the needing to burn so much fossil fuel. Or we may find other ways to deal with the problem. Maybe we'll come up with some new means of capturing and making dormant the CO2 which we've released -- maybe something similar to but much faster than the process whereby plants fix carbon within themselves and then get buried as inert matter to become fossil fuels over millions of years. Or there are a number of proposals to cool things back down again if the world does warm undesirably. A lot of these mitigation ideas are not popular with environmentalists, in part because they don't achieve the side objectives of regulating the economy and shrinking the population, and in part because the idea of people artificially messing with the climate is kind of worrying. After all, imagine that for one country, cooling is desirable, while for another warming is desirable. One could imagine things getting really messed up if some major government like China decided to go rogue and try to tweek the world climate to suit their own needs without worrying about how those efforts would affect other. And, of course, unintended consequences can be a bear. But one thing is for sure: A little realism on issues relating to greenhouse gasses and climate change does NOT necessitate taking on the kind of doom-and-gloom attitude and vision of humanity as a cancer which seem to underlie a lot of environmentalist thinking. Very good. The one point I'd add is that right now the incentives to develop emission lowering technologies aren't there because there is no price on emitting greenhouse gases. For example, right now it's pointless for companies to spend a lot of R&D on developing carbon capture and storage technologies, because no matter how cheap they make CCS it's still going to be more expensive than just doing nothing. So what you're left with is R&D funded by government or by private philanthropists, both of which have sort of mixed track records. Fortunately there's a simple solution. A modest carbon tax would create the necessary incentives and you can use the revenues to cut taxes on capital and labor, which are worse for the economy anyway. I have been a life-long conservationist and I don't believe that climate change has anything to do with people -- or if it does, anything significant. The people who say so don't believe it either. IF they did, they would not be going on and on about lightbulbs and low-flush toilets, which will do nothing to conserve resources. Instead, they would be after huge events that consume towns' worth of energy (Superbowl, anyone? ), unnecessary use of power for entertainment (how many movie and television studios do we need?) and the airline and cruise ship industries. But they don't. They also don't admit that, if they ARE right, there is nothing we can do about it. China and India are bigger polluters than we are and they are growing. Cripple the US and accomplish nothing? Yes, please! Not. But then, I pay attention to the science and the politics. The vast number of people (I am not including YOU) don't. Very balanced analysis. It's a hard thing for those who are non-scientifically literate to think about. We have little choice but to either take the "scientific establishment's" word for it, or suspect them of lying, depending on where our biases lie. And of course the politicians and media muddy the waters by accusing the two sides of bad faith. So it's helpful to read something that considers both sides in a rational manner. You might want to read this guest article for the temperature aspect, and this primary author article for the CO2 issue. Both are full of meaty science goodness, rather than political reasons to support or decry anthroprogenic global warming. Because the issue is so political at this point, I find it very difficult to distinguish what science is accurate, non-biased, or not deliberately falsified. Scientists are people, and have biases just like everyone else. However, stories about outright fabricated climate data etc. taint all the research. How am I as a layman supposed to reach any sort of conclusion in all this confusion? When the scientific community blacklists climate change skeptics, it looks to me like they're afraid of debate. So call me a fence sitter. If we can find ways to reduce our use of fossil fuels, that's great, but I'm not going to endorse everyone moving back into caves to reach some arbitrary fuel standards which might do nothing. Lauren and agellius raise a key point: most of us are not going to spend years intensively studying climatology, and so our opinions on the matter are going to come down to who we trust. That can be a tricky thing sometimes. Here in Texas, the most prestigious university when it comes to atmospheric science is Texas A&M. Recently, the Texas A&M Atmospheric Science department put out a statement on climate change signed by every one of their atmospheric science professors. The statement says that humans are causing climate change, and that if warming continues their will be serious challenges for human society and the environment. I've spoken with a couple of the the folks on the list. They are not big government liberals. There are really only a handful of people who have a background in climatology who wouldn't agree with the A&M statement. Mostly what you find are people who don't have a scholarly background on the issue. For me, I find their views on the subject to be more trustworthy that the opinion of a politician, or a science fiction novelist, or even of someone who has a scientific background in some other area. I don't think one has to assume duplicity among environmentalists. People tend to be really bad at math, and about thinking about the real impact of things that seem like a good idea, so I think it's not very surprising that people who honestly believe that greenhouse gas emissions are responsible for warming often get behind solutions which are unlikely to work very well. I have read a fair amount of material on the global warming question over the years (going back to when people called it global warming rather than climate change!) and while there's room for doubt on a number of issues I do not think the first link is correct that the standard analysis of the temperature data is wrong. The second link doesn't exactly make an argument as to whether significant changes in CO2 levels can be responsible for changes in temperature, it basically talks about the levels of detail at which things do or don't correlate, but on that issue to I'm pretty satisfied that (all other things being equal) significant increases in greenhouse gases (including CO2) would indeed cause warming. I agree that the political controversies around the issue add to doubt on the issue, in that most of us have to make our decisions on these things based on who we trust, and we tend to trust people based on our areas of agreement on other issues. Also, though, I want to be on record: no scientific view on the question of greenhouse gases and warming means that we need to move into caves or pass any particular regulation. Indeed, my view is mostly that the damage we'd cause by stopping development and ceasing to use technology would be far greater than the pain of just dealing with whatever effects happen to come along, and continuing to look into the tech involved in reducing emissions. That's a great quote. I'd forgotten about that one.